Why we Have a DIAPER Bank - And How You Can Help! Each year the Lowell Diaper Bank distributes 80,000 donated diapers to Lowell families in need. One-third of American families need diapers and can’t afford them, says the National Diaper Bank. Diapers can cost $80 a month per child and are not food-stamp eligible. The poorest families use 14 percent of their income for diapers alone - an average of $936 per child each year. Single moms struggle the most - without diapers, their children can't go to day care, and they can't go to work. Stretching time between diaper changes to make limited resources last can lead to serious health problems, such as urinary tract or staph infections. And no family should have to make a choice between buying diapers and paying for food, rent or utilities, such as heat. The 500 cases of diapers we distribute annually to Lowell families cost more than $15,000, not including the staff time of partner agencies (below) who work closely with the families in need of diapers. We replenish our diaper supply several times a year with in-kind donations made through diaper drives, an important and easy way to give back. The National Diaper Bank toolkit provides excellent resources for planning and marketing a diaper drive at work and in the community. To donate diapers, and for more information, please contact Nancy Coan at ncoan@ywcaoflowell.org. Lowell Alliance also welcomes cash donations for diaper purchases. Volunteers help restock the Diaper Bank. Agency info - join the Diaper Bank! Left to right: Mike Koziel and colleague Jeffrey Santer dropping off more than 50 cases of donated diapers. 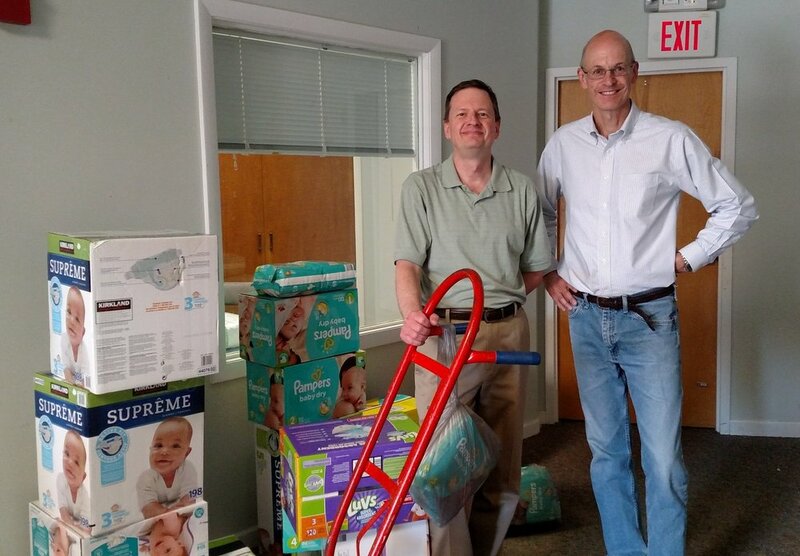 As our diaper supply dwindled last summer, Mike Koziel, an engineer at Lockheed Martin (Chelmsford) contacted us about organizing a company-wide diaper drive for the Lowell Diaper Bank. He had seen a TV story on the diaper divide and was moved to action. Mike and his colleagues organized a very successful diaper drive at Lockheed Martin, collecting over 50 cases and packages of diapers. Their efforts helped replenish our supplies and provided free, emergency diapers to hundreds of low-income families in the Lowell area. Thank you Mike and Lockheed Martin!